Here’s another simple way to attach edging to fabric without working dirctly onto the fabric, this time for more delicate fabrics like those used for garments and handkerchiefs. This pretty Rose Insertion works well as a corner as shown, and includes a pointed Rose Bud Lace Edging to match. Originally designed by Emma Boardman in 1920, it’s suitable for many purposes, and the lace edging and insertion may be used separately or in combination. Roses, butterﬂies and winding leaves decorate this summery ﬁlet crochet lace edging. 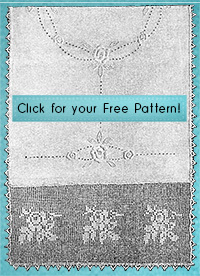 Designed in 1927 by Olive F. Ashcroft, it can be used as a border for a tablecloth or a dresser scarf. Make the narrow leaf border as long as you need, or omit it for a faster project. This design is very attractive and versatile. In ﬁne thread, the lace and insertion will be a very pretty trim for skirts, slips or other similar garments, and a yoke is easily arranged to match. Heavier thread makes a handsome stripe, with lace border, for a bedspread. A Greek Key and natural scallops enhance the morning glories in this wide lace edge, originally designed by M. Pintner in 1927. The scallops are made as you go with easy increases and decreases, with no need for an additional edge. Designed by Olive F. Ashcroft in 1926, this pretty pattern features three-dimensional ﬂower centers with crocheted clusters. Crochet a simple lace lily and cross edging for an altar cloth. Designed in 1924 by an unknown designer, this crochet pattern features scallops, open areas of lacets and bars, and a mitered corner with detailed instructions.